Today's free movie probably isn't now and probably won't be considered a classic. 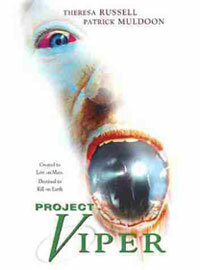 Project Viper is a 2002 science fiction-horror film that debuted on the SciFi channel (before it became SyFy). It was directed by Jim Wynorski (as Jay Andrews), whose specialty is B-movies and exploitation films. The plot is pretty cheesy: a secret project to combine human DNA and computer chips goes (unsurprisingly) terribly awry. One prototype is being carried on a shuttle to Mars, where its adaptability is meant to help in terraforming the Martian landscape. The first sign of a problem is when it kills the shuttle's crew. The second prototype is stolen from high tech company where it was developed. It soon escapes, and takes up residence in a lake near a small town, terrorizing the local inhabitants. The usual horror movie tropes apply: it's a bad sign when a young couple decides to park by the lake to make out and small nosy dogs don't fare very well either. The bioengineered monster it a fluid gray goo that conveniently forms tentacles when it wants to grab or skewer someone. It leaves a trail of slime along with the dead bodies in its wake. Nasty! Our hero, played by a tousle-haired Patrick Muldoon, must destroy the creature before the military has to nuke the town to save the world (of course!). Theresa Russell plays the head of the scientific team that developed Project Viper, so she comes along to help sort out the mess. The movie doesn't seem to take itself too seriously, which is why it could make a light easily digested appetizer in a double feature with a more serious feature film entree like Moon. Note: video only available in the United States.